I am excited to announce the official launch of Birthday Parties for CJ. We think that her birthday week is good timing, don't you? When Charlotte was very sick, many of her friends asked for donations to our cause (to help with medical expenses) instead of birthday gifts. We thought it was a wonderful idea and a great way to teach children about giving back to others who are less fortunate. 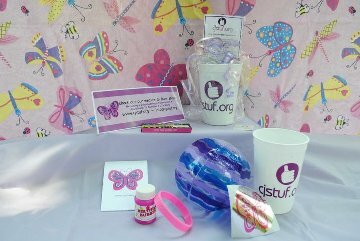 In that spirit, we have created a way for kids to give back to CJSTUF in honor of their special day. For more detailed pictures of the Goodie Bags, you can go HERE. We have also created handy cards that can be printed and inserted into your invitations to inform your friends. Finally, the birthday boy or girl will get an exclusive CJSTUF T-shirt. The tees will all be pink. Boy's version will say "TUF guys wear pink" and the Girl's version will say "I'm a TUF chick". We don't have pictures yet but I should be able to post them on the website soon. So now that I've gotten you SUPER excited about our latest endeavor, I know that you're thinking, "How do I sign up???" The answer is: Go to our website and submit this form to start the process. Feel free to email me if you have any specific questions. More blogging...because there is more news!